Many dog owners guessitmate what training equipment they should use, don’t get proper training lessons with said equipment for their dog. Or worse just buy training collars or harnesses off the web or in a big box store and do not do ANY research about the product – or even know how to use it! Or they ask for advice in a Facebook group and then go out and get the product without ANY help from a professional. If you’re a dog trainer, I am sure you have heard this before, “That’s what worked for my last dog,” and the owner just assumes that what worked for their last dog will be the same for their new dog. And, yes in some instances that can be the case, but not always. On nearly a daily basis the topic comes up for me – whether it is when I am out walking my dog Cody, meeting someone with a new puppy, they always seem to ask me training questions. And while I am not a trainer in that, I don’t get hired to train dogs, I have been training dogs since I was 10-years old, I taught responsible dog ownership classes for years, have worked with extreme cases (highly aggressive and/or unstable dogs) while pet sitting, and ended up training dogs in the process and have given training advice to friends. (And have asked for advice from dog training professional friends for some of those extreme cases). I have also recomended professional trainers many times over. I am sure this is something my dog training friends see all the time also, and it can be cringe worthy when seeing someone walk a dog with a training collar/harness and seemingly not have a CLUE as to what they are doing! Or WORSE hurting or injurying the dog out of their own frustration of not fully understanding of the training collar/harness and that they are hurting their dog. The topic comes up amoung friends as well – as recently as this past weekend while on a dog walk with a lot of different dogs, a bunch of us were talking dog training – what type of collars, harnesses, no-pull apparatuses we use, etc., what we want to try next (especially for our strong pullers!). I have always said, you have to find the right dog trainer and training collar/harness for your dog, your situation and your family. Every dog is different, every dog owner is different and trainers will have different training advice for you and your dog. There is nothing wrong with interviewing or working with different dog trainers to see which one will be the best fit. 1. Seek out and find a professional dog trainer to help you purchase any training equipment, have the trainer teach YOU how to use it properly and to fit it properly. Fit is very important. Dogs can slip out of collars/harnesses if you don’t have it on correctly. 2. Don’t go to a big box store and rely on the sales clerk to sell you the right collar/harness. Some trainers will go with you to the store and help you purchase the correct item you need. 3. You may go through many different kinds of training collars/harnesses until you find the right one that works for your dog. Don’t be discouraged by that. It’s ok! 5. Make your training sessions Fun! Dogs can feel your frustration right down your 6-foot lead. Dogs want to learn and please their owners – so making it a fun, positive session for you and your dog – you will both look forward to training. You will be so proud when your dog learns a new trick! 6. Train your dog in different senerios, different locations – and regularly. You will see a big difference in how your dog reacts to things and his/her excitement level. 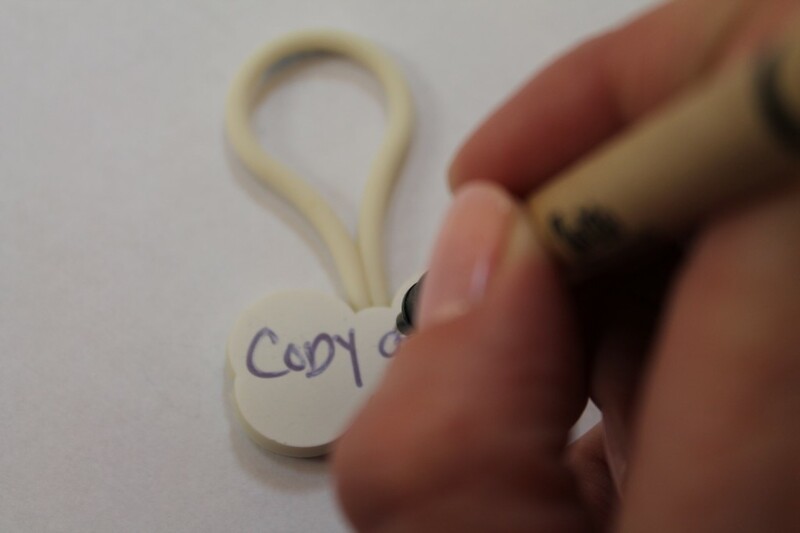 For example: My dog Cody on short walks can be easily walked on a flat collar or his regular collar. If I know he is going to be very overstimulated (like visiting a pet store, walking with a bunch of new dogs – he gets really happily excited) – he will have a training collar on. I am working with him to get him completely back to a flat collar – but it is a work in progress, and that is OK! I also always have treats in my pocket to be able to get him to focus on me when out and about if he is really excite-a-bull! I work with Cody on a regular basis so he will focus on me when I ask him to. He has a couple of training collars – for different situations. I do training sessions as part of every single walk. Even it if is a ’stop, sit, stay, look, good boy!’ Takes less than a minute. I also incorporate heel training sessions into his walk regularly, he’s getting there. 7. My last tip for equipment is please do Not use retractable leashes when training (or at all). 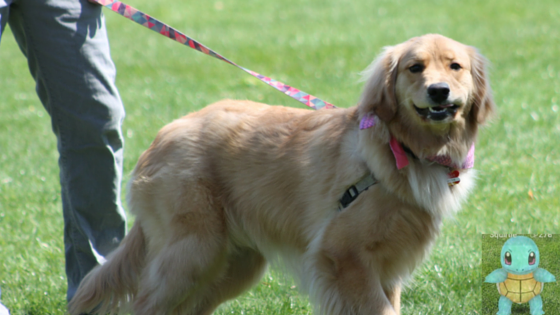 You can ‘feel’ your dog through the leash in your hand when using a 6-foot leash. (Meaning you can feel your dog moving around while on the walk, how far he is getting from you – something you can NOT feel while he is on a retractable). I personally prefer a good quality 6-foot leather leash for regular dog walks. I have had Cody 10-months, the leather leash I use for him, I have had for 15 years. It doesn’t look like have had it 15-years! Seeing so many different types of dog training equipment on the market, I understand how overwhelming it can be for dog owners. That’s why hiring a professional dog trainer with experience, that has plenty of references and continues their own education in dog training, is so important for you and your dog. You want to have fun with your dog – even while training! Did you know that not all dogs can swim? Most people think that swimming comes naturally to dogs. We have all seen the funny videos of little dogs doing the doggie paddle in the air when held above the bath water by their owners, but that movement doesn’t mean they will be able to swim, stay afloat or tread water. Being on an Island, dog owners should consider this when out at the beach, near a lake with their dogs, or hanging out by the pool. We are lucky in this day and age there are life jackets made for dogs, scamper ramps to help dogs out of a pool and dog trainers willing to teach dogs to swim. But that doesn’t mean your dog is going to like it or have a swimming technique come naturally to them. Some things dog owners should never do when trying to get your dog to swim, is force your dog into the water by dragging or throwing a dog in. It’s not only cruel, but can scare a dog or make the dog fearful of water. If you have a puppy, you want to start young introducing the pup to the water, always, always monitored by an adult and never left alone near a body of water. 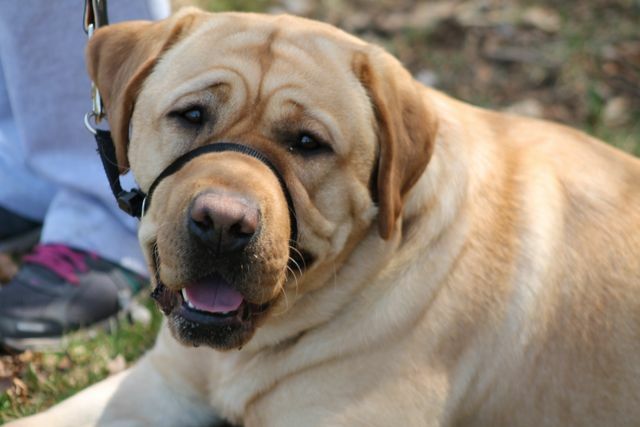 Keep the puppy leashed, and it you have a dog life jacket (properly fitted for the dog’s size), have the puppy wear it. You can get the puppy accustomed to wearing it, by having the dog wear the vest for a few minutes at a time while indoors or on a short walk. While the puppy is leashed you can go into a pool or in the calm water on a shore and just have the pup wade in the water along side of you. Let the dog go in on its own or if you have a dog or friend with a dog that likes the water – that will often help your puppy have less fear. Photo credit, American Boxer Club. 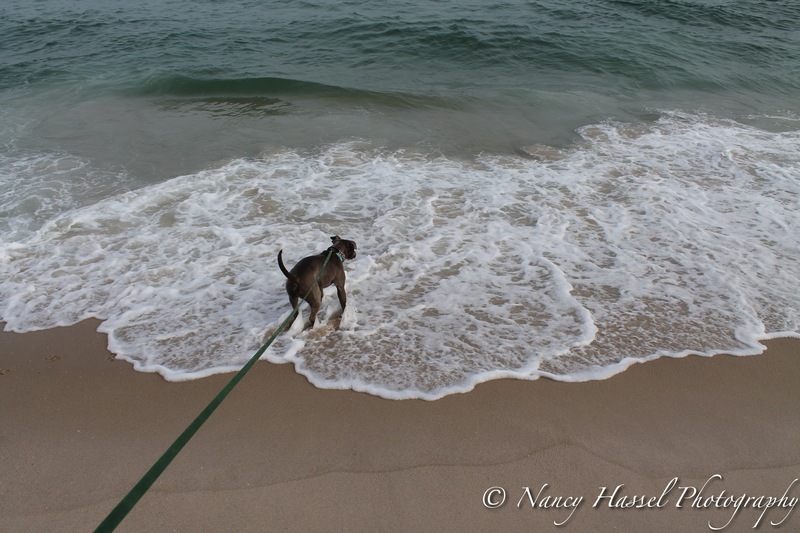 Some dog breeds do take much more naturally to the water as that is what they were bred for. Labs, Goldens, Portuguese Water Dogs, Chesapeake Bay Retrievers, to name a few are natural water dogs, but they still may need help along the way learning. Some breeds are not designed for long swims or swimming at all. My Pit Bull Cody, is an just learning to swim, but his mouth is so wide that he can inadvertently swallow a lot of water while swimming. Which can make him sick, so his swim time is never more than 10 to 15-minutes, and that is in and out of the water. If you are unsure how to teach your dog to swim, the best thing to do is to hire a skilled dog trainer who knows how to do this properly. (Interview the trainer to be sure they know how to teach this). 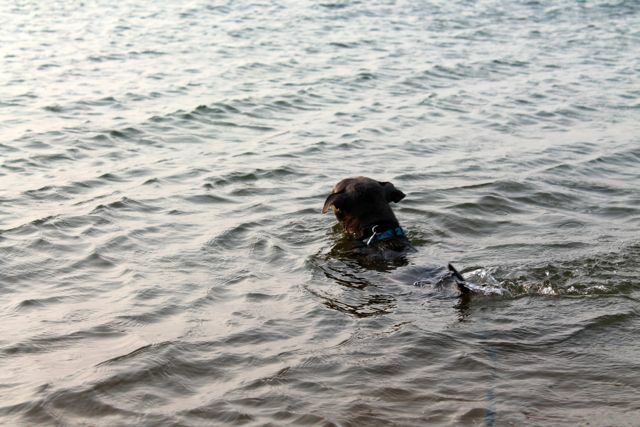 In teaching a dog to swim it’s best to be in the water with the dog as some dogs can panic, and you or the dog trainer can help assist them out. Another thing to consider is if you are at the ocean beach, be careful of throwing a ball or stick into rough surf – this could easily knock down a dog and injure the dog. Dogs can easily be tossed around by a wave. 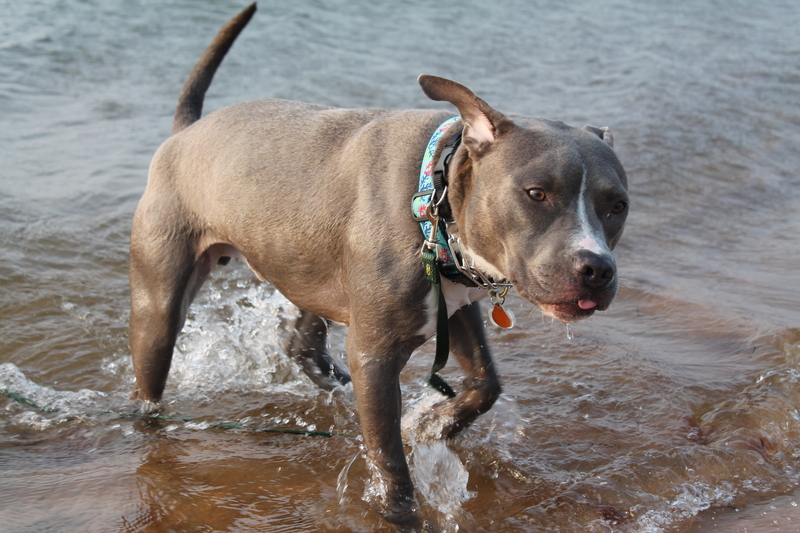 Some bay beaches have a quick drop off, and if your dog is not used to swimming, a deep drop off can be dangerous. While we all want our dogs to cool off, not every dog is suited to swim. So take steps to enjoy the water with your dog, but safety first! Cody was on a long line and I did not let him into the waves. 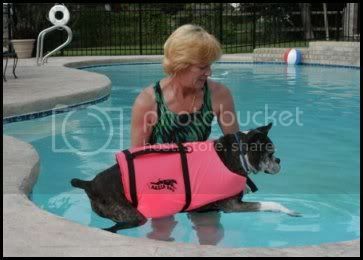 The life jacket can also be a safety precaution while out kayaking, boating or paddle boarding with your dog. Also a long line, not a retractable leash, a long leash made of cotton that can be purchased at most pet stores in 10, 15, 25 and 50 in length, is a great tool while teaching a dog to swim. If the dog is over enthusiastic and not on a leash the dog can keep going and going. Believe me I have witnessed this in person. Funny at first, scary when the dog was pretty far out into the bay, luckily for the owner the dog turned and finally headed back. If the owner had a long line, he could have gently pulled the dog back towards the shore. Did you ever think about safety while walking your dog at night? Now that it is summer time and walking in the evening can be a great time to take your pup for a long walk since it is cooler in the evening. Don’t forget that while when you leave it may have been light out and on your way back it is dark out. It amazes me how many people run, bike, or walk their dogs in the darkness of night without any reflective or light colored clothing on them or their pets. 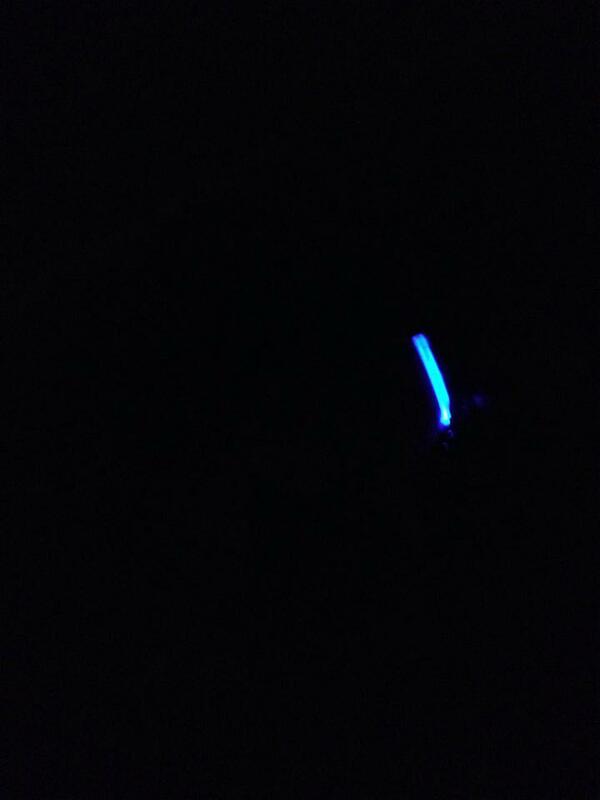 Recently while walking my dark grey (blue if you will) dog, in the late evening, I put an LED color on him knowing it would be dark upon our walk back. I lit that collar up when it got dark so, even though he was on a 6-foot leash and we were on the sidewalk for 90% of the walk, he would be more visible with the collar on while walking next to me. Here on Long Island the summer brings out complete idiot drivers, (have you noticed or am I getting old? ), especially at night. People fly around corners, don’t stop at stop signs – and don’t look either way. So here are some simple tips to help keep you and your dog safe while walking on a beautiful summer night! 1. Get an LED collar, (and leash), for your dog. They are becoming more popluar and can blink or hold a steady light and make your dog more visible. Cody walking with me at night. You wouldn’t see him without that collar! 3. DO NOT USE retractable leashes at night. 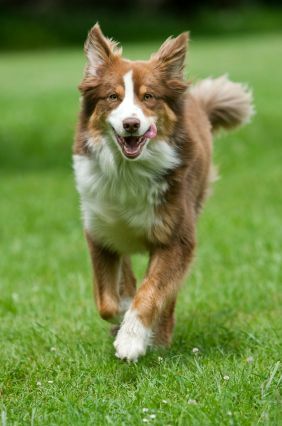 If your dog is zipped out 20-feet ahead of you, even if he is up into some bushes or ‘taking care of business’ and you have to get him out of harms way – you will NOT be able to fast enough. And that skinny little line is hardly visible when you are a distance away, and likely a driver is not going to see your dog. Enough said, right? 4. Be sure your dog is microchipped and has a proper ID tag on him with proper contact number. Your cell number is best because let’s face it we don’t often change our cell number’s. But a back up number or email is a good idea on that tag if you can fit it. 5. Have a yard? Check your gates! Maybe you just came back from a walk and decide to let Buster take a romp in the yard, but your husband, kids or landscaper left the gate open – now it is night, dark and your dog is out of the yard. 6. No sidewalk to walk with your dog? You should have light clothing on and a flashlight and be careful when walking on the side of the road! Or find a safer area to walk your dog at night that has a sidewalk. 7. This seems like a no-brainer, but be sure your cell phone is charged fully when you set out to leave for your walk. Just in case you need it for the flash light, to make a call, etc. Enjoy the summer evening walks with your dog and just keep these tips in mind. Do you do anything in addition to these tips? We would love to hear it in the comment section below! Every year we set new goals for ourselves – lose weight, get healthy, land a promotion, find that special someone. But what about our dogs – should we set goals for them? The folks at Protect Your Bubble pet health insurance brand say yes! And they’ve narrowed it down to one very important thing. In fact, it’s one of the most important things you can ever teach your dog – it could save his or her life one day. It’s called emergency recall and most pet loving families have neglected to teach Fido this command for a number of reasons – it can be tough to train, it can be boring (for your dog) to learn, and it’s not used very often. But boy will your tail be wagging when you need to use it and your dog listens. 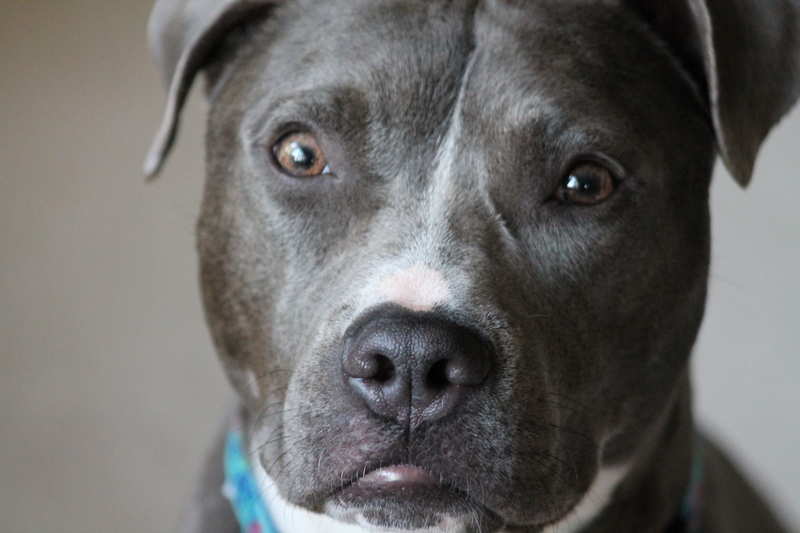 An ‘emergency recall’ command is very different from a ‘come when called’ command, according to pet behaviorist and certified dog trainer Kate Jackson with Jabula Dog Academy. “Dogs are used to hearing the word ‘come’ and often there are strings attached – they’re in trouble, they’re leaving the dog park or they’re headed to the vet. Because the ‘come here’ command is used so often, many dogs decide to ignore it to avoid the consequences it may bring. That’s why teaching an emergency recall is so important – it’s the ‘drop everything you are doing and come running back to me immediately’ command. Watch behaviorist Kate Jackson discuss this command. If you don’t already use an emergency recall command and you’ve trained your dog to do other tasks, this command can be taught by using positive reinforcement and repetition. If you’re not comfortable training your dog, Protect Your Bubble recommends searching for a certified trainer in your area and finding one with whom you and your pooch are comfortable. And remember, for those with a Protect Your Bubble pet health insurance policy, behaviorists can be covered under certain policies, so give us a call to find out (toll free 1-855-792-7387). Training this command will help ensure a healthy and happy year with your beloved furry family members. Headquartered in Atlanta, GA, Protect Your Bubble is available online, via mobile app or phone, and allows consumers to understand, buy and protect what’s most important to them. The insurance company offers the following types of insurance plans: Pet, Car Rental Insurance, Travel and Gadget. Pet plans provide up to 90 percent reimbursement for covered vet charges for eligible accidents, illnesses, hereditary conditions and behavioral treatments and alternative therapies. They allow owners to visit any licensed vet in the country. Additionally, annual deductible options start at $100 which only need to be met once per plan year. 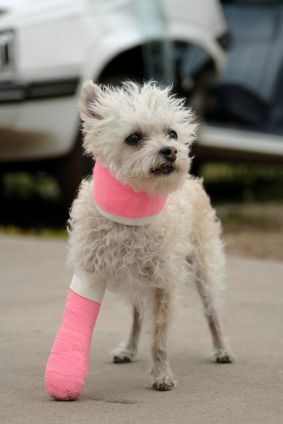 This is a sponsored post for LIPetPlace.com to teach a life saving command to your dog.